An MD5 checksum is a 32 digit hexadecimal number that represents the hash of the contents of a file. Changes to the contents of the file give a different checksum, so verifying the MD5 is a great way to ensure that a file is unchanged. The calculation of an MD5 is an industry standard so the integrity can be checked on any system. Even if performing a Quick Verify, YoYotta always calculates the MD5 checksum and stores it as an extended attribute for every file. This means that the file can be easily checked at any time in the future. As shown here a checksum can be generated using the terminal. YoYotta does this automatically at high speed. YoYotta v3 generates both MD5 and xxHash checksums. xxHash is a newer checksum that is faster to generate, however as it's less common so YoYotta always generates both. Normally keep this option turned off. If turned on then during verification YoYotta reads the source files again to make sure they are consistent. The source verify happens in parallel with the destination verify, so it will only add time if the source read speed is slow. In this case you can turn it off. Use Source verify only if you think there is a problem with a camera card or hard drive. Keep Quick Verify turned off when archiving to perform a full verification. 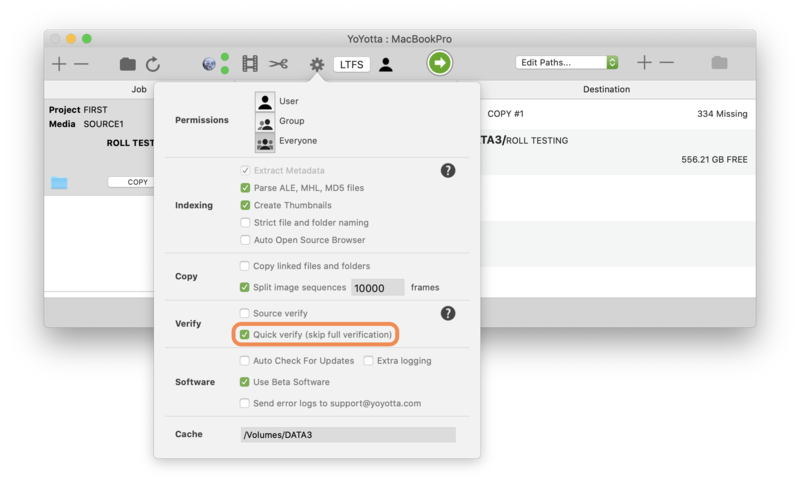 Turn Quick Verify on when restoring files to skip the full verify. YoYotta will just check the file size. Even with Quick Verify turned on YoYotta always calculates and saves both MD5 and xxHash checksums for each file, allowing a full verification to be performed later. 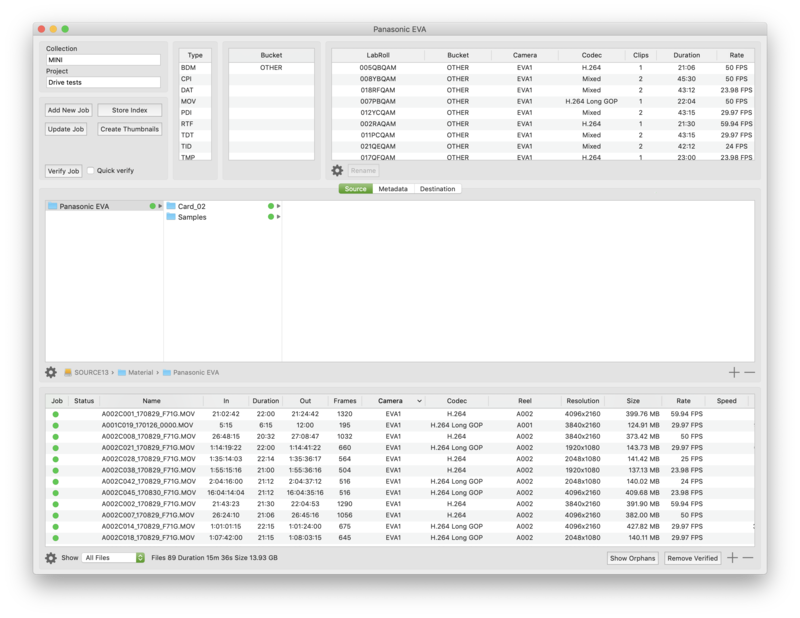 If you are copying material in a chain, for example from camera cards to shuttle drive, then from drives to RAID, then from RAID to LTO tape then you can use Quick Verify for each copy apart from the last one. Each subsequent copy will verify the source against the previous checksum. However you should not erase the source until it's copy has been copied. Add a drive or drop a folder into the job table. Click the folder above the job table to open the Source Browser. When YoYotta has finished indexing the files click Verify Job. YoYotta will read back all files and compare them against the original checksum. This is a full verification. A quick verification will check to see if the files have ever been verified. If not then they will be fully verified. If they have been verified before, then YoYotta will just check files sizes, modification time and file location. To run a quick verify turn Quick Verify on, then click Verify Job. The verification speed and job time estimate will be shown in the job table. As files are verified their status will be marked green in the Source Browser file table. The verify job can be stopped by clicking the main stop/start button.